In the last twenty years, most cars have shifted from using a standard wheel-controlled steering and handling system to a steering system that's controlled by a wheel, yet carried out by both computers and the driver themselves. It's known as power steering, and it's one of many innovations that have allowed modern cars to become more comfortable, drivable, and easier to control than before. This steering mechanism is used in combination with the car's steering column – a series of devices used to transfer momentum from the steering wheel, and the electronic systems that respond to it, to the wheels and drive train of the car. In short, just like a vehicle's clutch shifts power from an engine to the car's wheels, a steering column transfers steering momentum from the wheel to the car itself. It's a proven system – one that's been used for decades and has formed the basis of many of the best handling cars in the world. From sports cars to efficient and economical city cars, delivery trucks to road racers, the steering column has been an essential and successful element of car design. But just like any other aspect of a motor vehicle, it too is prone to breakages, damage, and malfunctions. In fact, since the steering column is home to all of electrical devices attached to your steering wheel – the turn signal stalks, your window and windscreen wiper controls, and even your cruise control – it can be the origin of many potentially expensive breakages. From replacing parts to refitting entire sides of the steering column, issues with this part of your car can quickly turn into expensive fixes. Thankfully, however, a wide range of steering column parts are available, both from your car's own manufacturer and from third-party suppliers. In this brief guide, we've looked at the common issues many car owners face with their steering columns, and the replacement parts that are available for a quick fix, a complete parts replacement, or a lengthy car repair. At the heart of the steering column is the steering shaft and the bearing unit – the two pieces of your car that are most responsible for transferring your turns at the wheel into real turns from your car. A steering column uses a simple shaft to relay these instructions down to the car, or alternatively to its built-in computer. These are then turned into real action from the car's wheels and steering system. This can be prone to failure, particularly in cars that have been driven extensively or aggressively with little or no maintenance. In most cases, a simple replacement is all that's required. However, some older vehicles may require that both the steering shaft and the bearing unit be replaced. This tends to be diagnosed by checking how loose the steering is – wobbly wheels often need repairs. In cars that are prone to torque steer, replacing the steering column's bearing kit can have some effect on the wheel's movement during acceleration. 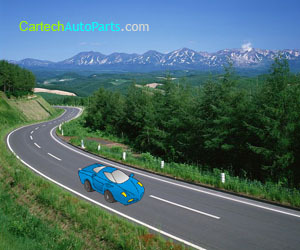 However, this is often a result of the engine generating too much power for the car's suspension base, and requires more extensive work for a noticeable effect to occur. Different bearing grades can, however, have some positive effects. Then there's the steering column's height adjustment – a common feature in many cars, and one of the first pieces to fail in many steering columns. Older cars, particularly those with manual steering wheel adjustment modules, are prone to failure and damage over time. This can either lock a wheel in one position – a minor annoyance – or reduce any resistance to height adjustment at all. This means that the wheel is essentially floating, with the entire steering column moving around when pressure is applied. This requires a replacement steering column seal, and in some cases an entirely new adjustment module. These vary from one vehicle to another, so it's important to see what's required in your car, and whether it's available from a dealer or qualified mechanic's shop. Some cars, particularly high-end luxury cars, use what's known as a 'power coupling' to reduce the effects of road surfaces on the steering wheel itself. These eliminate vibration from the road for car drivers, making even the most difficult turns and bumpy roads manageable. These units are often a dealer-only part, or are available through a certified network of mechanics for your car company. Finally, there are the various electrical components that are attached to the steering column, many of which rely on the steering column's standard operation in order to function. If you find that one issue with your steering column is leading to electrical failures, take your car to a mechanic. A cut in your electrical wiring or steering column could cause other column-mounted units to start to fail. An essential part of any modern car, and a technically complex part of most high-end vehicles, the steering column is a piece of technology that's remained largely the same over the years, despite a few key changes. With a long service life, it's not a frequent repair, although it is very noticeable if anything goes wrong – steering wobble, immense torque steer, and poor response are all symptoms. Regardless of the type of car you drive, its age, or its power output, it's essential that you keep it in good condition – this includes regular servicing of the steering column and its many parts. A strong and healthy car responds quickly, keeping you and your passengers safe. With your steering column in good share, your car won't just perform better – it'll keep you safer while you're on the road.